King Kong is one of the most memorable monsters in all of history, but I suspect “Kong: Skull Island” will do little to add to that legacy. The ape was at the center of three films that took advantage of modern day technology and helped pushed the limits to how good movies could look. The original classic brought stop motion in the new era. For a 1976 version life sized animatronics were used to bring the ape to life (as well as allow him to upgrade from climbing the Empire State Building to climbing the still fairly new World Trade Center buildings). When the ape graced the screens in 2003 he had help from visionary Peter Jackson, who used state-of-the-art motion capture and computer graphics to tell the story. I suppose you could say that “Kong: Skull Island” is the first Kong movie to use 3D, but that feels more like an afterthought than a way to make the film truly stand out. For this movie has little to no ground-breaking technology to serve the story better. Indeed, it looks very good, but in this day and age so does everything else. It doesn’t simply repeat the original story though, which at least puts my fear of having to sit through the same story to rest. This time around those pesky humans are going to the island not to make a movie, but to explore the last unexplored piece of land in the world. The group involves a millionaire looking for respect, an anti-war photo journalist, and a military leader who is taking the loss of the Vietnam War particularly hard. They fly into the island, drop some bombs, and have their helicopters knocked down by the Eighth Wonder of the World himself. From here the movie is pretty much that of survival. 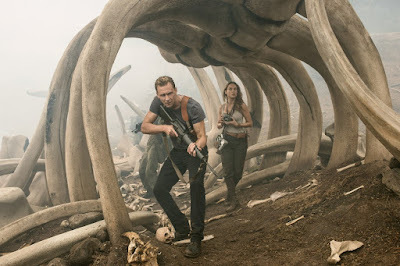 A former British Special Air Service Captain named James Conrad (Tom Hiddleston) snaps into war mode as he attempts to save as many people as he possibly can. Samuel L. Jackson plays Lieutenant Colonel Preston Packard, who is so blind to the fact that he fears his life has no meaning unless there is an enemy to fight, that he puts everyone’s lives in danger as a result. The best character is Hank Marlow (John C. Reilly), a soldier who got stranded on the island during World War II and would give anything to go home to his wife and eat a hot dog while watching a Cubs game. Given the right amount of time, all of this could have been surprisingly deep and a little emotional. In “Kong: Skull Island” though, this is window dressing for humans to survive giant spiders, weird dinosaur aliens, all while discovering that the big giant monkey might not be as bad as they fear he is. The star of the show is the action sequences, which are largely fun and rarely boring. A little tedious at times and never imaginative, but they get the job done none-the-less. I’m not sure if I am willing to go so far as to call “Kong: Skull Island” a disappointment because it’s not like I had much to expect from the movie in the first place. It is strange though to make a big budget Hollywood movie with a familiar name attached to it and do little with the star of the show. Kong is probably in about thirty-five minutes of the movie, and seems more like a McGuffin than a main protagonist. Granted, a similar tactic was used in “Godzilla” a few years ago, but that movie had the knowledge to make the most with the human characters they had, and to make the few scenes with Godzilla in them count. Here, it feels like Kong was brought back to the big screen so that a studio would have a bankable name, but the movie never really knows what to do with the main character it goes through so much trouble to sell. I would be remise if I didn’t mention that some of the same producers for this movie worked on the vastly superior “Godzilla” reboot, which took the timeless monster and brought him into the modern age with a movie that was interesting and deep. The only thing that kept this movie from reaching that same status was the studio knowledge that people care more about King Kong than they do about the humans, ignoring the fact that it was in the conflict between man and beast which resulted in movies that were largely acclaimed by audiences. 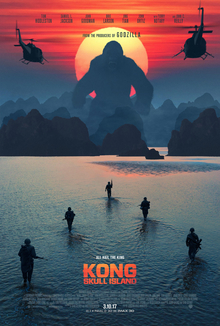 “Kong: Skull Island” is unlikely to have the lasting impact of previous films, but, sadly, for this film, I suspect that may have been a calculated desired result. Parents, there is a fair amount of violence and destruction, involving both humans and animals. Recommended for ages 12 and up.